Garden lilies: L. testaceum, L. washingtonianum, L. humboldtii, and more – they came by the dozens from across North America, and they came to a small corner of mid-coast Maine. Their destination? The gardens of the Spite House in Rockport, Maine. Despite some plants having come thousands of miles their travels are not nearly as impressive as that of the Spite House itself. Listed on the National Register of Historic Places since 1974, the Spite House owes its existence to a family dispute from the early 19th century. When Captain Thomas McCobb returned from a long voyage at sea, he discovered that his relatives had broken his father’s will and moved into the fine house his father had built in Phippsburg. In retaliation, or “spite,” he had an even more ornate home built strikingly close to his father’s usurped house. The house was completed in 1806. By the early 20th century the house had seen better times and, in 1925, it was bought by Mr. and Mrs. Donald D. Dodge. Shortly after purchasing the home, Mr. Dodge arranged for it to be moved (completely intact) from Phippsburg to Deadman’s Point in Rockport. The house was braced, lifted onto a barge, and shipped 85 miles to its present location. Once safely back on dry land, two more wings were built. The following year, Mr. Dodge had gardens installed according to a design by the landscape architect Robert Wheelwright. Now, thanks to a recent donation to the Maine Historical Society, we know just what bloomed! Relatives of Mr. Dodge donated his documents pertaining to the gardens of the Spite House to the Maine Historical Society. Among the papers are purchase orders, receipts, plant lists, notes on plant care and propagation, catalogs, and letters. Looking through the correspondence with over half a dozen plant nurseries (most of which appear to no longer exist), you discover the wide variety of lilies, roses, and alpine plants ordered and planted by Mr. Dodge and his gardener, Henry B. Williams, during the 1950’s. Mr. Dodge kept carbon copies of his letters detailing their successes and failures. It’s clear that he was an avid gardener with a keen interest in learning all he could about lily propagation. Reviewing the papers, you’re regaled with their struggles to control a common plant disease, Botrytis, that plagued particular species, especially during wet and damp periods of weather. Controlling the local woodcock population also took precedence, as it’s assumed the gamebirds – primarily an insect eating species – rooted around in the flower beds, disturbing young seedlings and causing general havoc to the flower beds. I am having a wonderful time in my garden now preparing the planting arrangements for these lilies and planning where to put them. You can be assured they will have every care possible. They are planted amongst shrubs – Azaleas, Kalmia, Rhododendron, Mahonia, Bayberry – but I have learned to give them plenty of room and I have also learned to restrict the roots of the Mahonias and Bayberries by putting in sheets of zinc to give the lilies a head start. The Kalmias and Rhododendron are no problem and the same applies to most Azaleas but some of the Azaleas do have runners. However, I am having a hard time keeping up with my woodcock shooting and getting the lilies planted too! By all appearances, the time period covered in the collection marked one of the high points in the history of the Spite House Gardens. While under the care of Mr. Williams, the gardens underwent an extensive expansion with a lily and wildflower garden planted in the woods south of the house, installations of a rock garden, an enclosed rose garden, island gardens in the lawns surrounding the property, and the construction of a greenhouse. All in all, the collection provides a glimpse into what it took to plan, execute, and nurture flower gardens on the coast of Maine nearly 70 years ago! In the 1920s and 1930s City Hall was the place to enjoy special events in Portland, Maine! Parades and processions marched to City Hall, presidents and politicians spoke from its front steps to crowds gathered in the street, and honorees received awards and recognition outside of City Hall. Essentially, when something exciting happened in Portland, at least a part of it took place at City Hall. Below are event images at City Hall in the 1920s and 1930s from the Gannett Glass Plate Negative Collection (Coll. 1949) given to the Society by the Portland Press Herald. These images are being digitized and made available on Maine Memory Network thanks to a grant in 2016 from the Institute of Museum and Library Services. At the Maine Centennial celebration in 1920, several high-ranking Naval officers visited City Hall during the celebration. City Hall was decorated in patriotic colors, and a large crowd was gathered around the officers. From left to right: Commander Joss Manoel de Carvalho of the Portuguese battle cruiser, San Gabriel; Rear Admiral E.W. Erbele, U.S.N. commanding Battleship Division 5, U.S. Atlantic Fleet, and U.S.S. Utah, Flagship; Rear Admiral Allan F. Everett, R.N. of M.M.S. Calcutta; Captain Henry H. Hough, U.S. commanding the U.S.S. Utah; Captain P.N. Olmstead U.S.N. commanding the U.S.S. Florida. 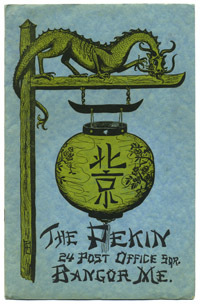 This image appeared on page six of the Tuesday, June 29, 1920, issue of the Portland Evening Express. In the summer of 1921, President Warren Harding visited New Hampshire and Maine. In Maine, Harding addressed a crowd from the steps of City Hall in Portland and concluded his visit with a game of golf at the Poland Spring House. People congregated on Congress Street during the President’s speech. He was joined by the First Lady and other politicians during his address. In 1925, the annual convention of the National Federation of Business and Professional Women’s Clubs (NFBPWC) was held in Portland. Delegates from all over the country came to Portland for the event. Many arrived by train at Union Station and traveled by special train cars for delegates. Two women (below) from Wyoming posed for a photograph beside their car and outside of City Hall. Franklin D. Roosevelt also made a trip to Portland and City Hall on October 31, 1932. Governor-Elect Louis Brann (right), introduced him to the crowd. Presidential candidate Roosevelt gave a campaign address to the people of Maine at this event. In his address, he explained his plans to work with Democrats and Republicans and to work in harmony with the other branches of government. Roosevelt went on to win the 1932 presidential election; although Maine was one of the six states he lost. Memorial Day parades and celebration in often concluded at City Hall in the 1920s and 1930s. Many military officers and their spouses were honored for their service or honored those who died in service. Families often attended these events and gathered on Congress Street outside of City Hall. Large-scale celebrations usually happened at City Hall, but smaller events often happened here as well. Many group photographs were taken on the front steps throughout the years: Boy Scout troops, Portland High School clubs, winners of Miss Portland Beauty Pageants, etc. often posed on the steps. We hope you have enjoyed this brief walk down memory lane to Portland’s City Hall almost a century ago! Stipend supported Teacher Workshops coming in August! Maine Historical Society recently received a Library of Congress Teaching with Primary Sources grant to create robust lesson plans pairing historical items on Maine Memory Network with related items from the Library of Congress’s American Memory. Curriculum is being created on three pilot topics (immigration, World War I, and Maine statehood) and two teacher workshops will be held in August (one in Portland on August 4, one in Bangor on August 6) to share the plans and provide hands on sessions using the databases. Stipends of $50 are available to attend the workshop. Teachers are encouraged to share what they learn back in their district with members of their teaching teams and other colleagues. Five teachers who attend the workshops will be invited to serve as case studies during the 2015-2016 academic year for an additional, larger stipend. Case studies involve having 4-6 classroom visits by MHS education staff throughout the year. If would you like to learn more about the workshops and get a registration form, please email Kathleen Neumann, Manager of School Programs, at kneumann@mainehistory.org. If you know a teacher who might be interested, please pass this along. Happy New Year! Can we just take a minute and say Thanks?! 2014 was an incredible year for MHS, much due to all the wonderful people who visited us for public programs, listened to our podcasts, became members, researched in our library, contributed to our collections, and engaged with us in person (throughout the state) and online. We love creating programs and exhibitions for our diverse audiences (in Maine and around the world) and hope that if you haven’t had a chance to join the MHS community, 2015 will be your year to do it. Drop us a line if there’s something of particular interest that you’d like to see us doing in the new year–we welcome your feedback! We can’t wait to make history with you in 2015! We entered 2014 with two incredible exhibitions already on display at MHS. Our main gallery featured This Rebellion: Maine and the Civil War (June 28, 2013 – May 26, 2014), which was a stop on the new 22-site Maine Civil War Trail. We developed many public programs and online resources dedicated to the Civil War, and if you missed seeing the exhibition in person, you can still view the online version on the Maine Memory Network. On display in the Shettleworth Lecture Hall was the charming show Dear Old Maine, I’m Coming Back: Home & Hearth Reflected in the Maine Historical Society Sheet Music Collection (November 1, 2013 – February 22, 2014). Maine Historical Society participates in Portland’s First Friday Art Walk, and visitors in 2014 were able to engage in our exhibitions at no charge on those select evenings. Stay tuned for 2015 Art Walk events at MHS! On June 26, our current exhibition HOME: The Longfellow House and the Emergence of Portland opened to a crowd of MHS members and friends, all eager to see the much-anticipated new show that explores the evolution of the Wadsworth-Longfellow House and our beloved city. View images from the opening reception in this blog post, and read an MHS staffer’s review in the post Potty Talk: Fragile Objects Found in a Privy. If you aren’t planning a trip to Maine before this exhibition closes, you can still interact with its online component (but trust us, the in-person experience is worth it!). When Peleg Wadsworth built the Longfellow House in 1785, it was on the rural outskirts of Portland. By the early 1800s, the House was at the center of a bustling, modern New England city. Since then, Portland has boomed, burned, boomed again, busted, and reemerged as a vibrant, forward-looking city. Through it all, the Wadsworth-Longfellow House has been a constant witness to the life of an emerging community. The stories of the Wadsworth and Longfellow families and an ever-changing cast of neighbors on their block—families, hotels, businesses, tenements, etc.—help explain how Portland has become the beloved, livable city we know today. 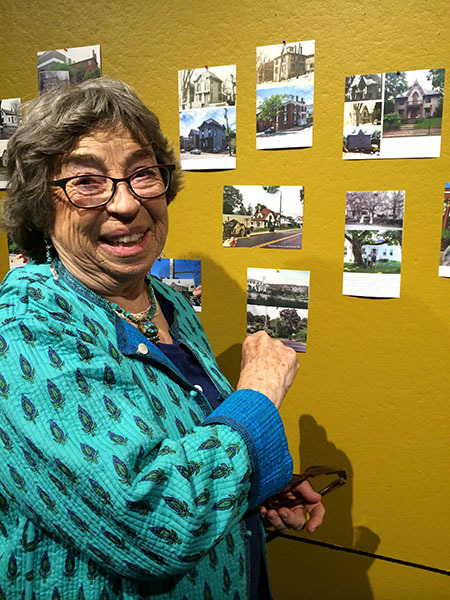 We collaborated with the public for one particular display “Your Home: Past & Present” in which folks took photos of their homes as they appear today, and submitted them to us along with historical images of their homes (many found on Maine Memory Network). Learn more about how you can participate in this project, and view some of the submissions in our Facebook album or website. Throughout 2015, HOME and our related public programs will provide context and a rich forum for discussing issues in the contemporary life of the Portland. 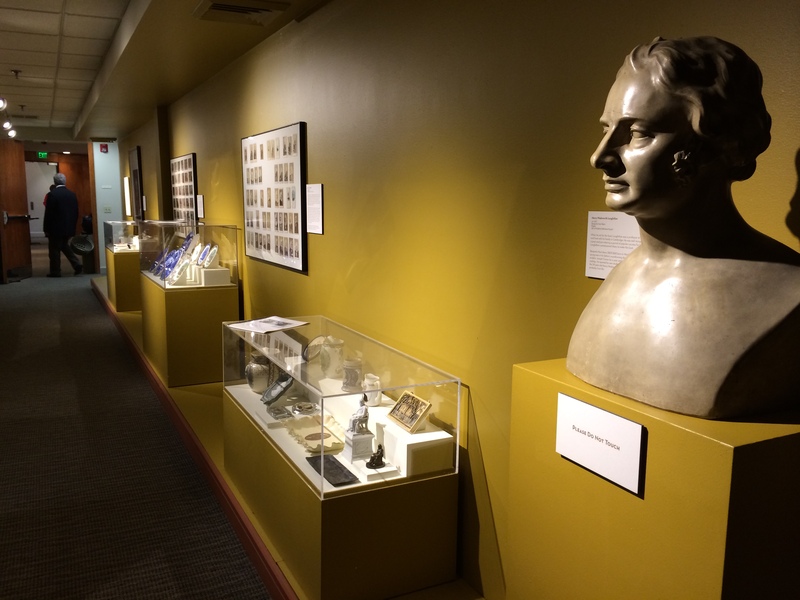 In conjunction with HOME, we displayed the show Remembering Our Visit: Souvenir China and Mementos of the Longfellow House (June 26 – present), in the Showcase Gallery, which features objects relating to Henry Wadsworth Longfellow and his boyhood home that demonstrates the poet’s wide public appeal. Collecting souvenirs became popular in the late 1800s with the expansion of the railways and the rise of leisure time in the United States. Local dry goods, crockery, and glassware retailers commissioned pieces and made them available for those who wanted a keepsake of their visit to Portland and the Wadsworth-Longfellow House. Throughout 2014, we presented five exhibitions, contributed by MHS staff from different departments, in this space–the first being the aforementioned Dear Old Maine I’m Coming Back. From Chop Suey to Washington Pie: Maine Menus (February 24 – April 3), was curated by our Archivist & Cataloger Nancy Noble, and highlighted the eclectic menu collections at the Brown Library. This compilation of vintage menus was inspired by a blog post written by Noble, that was picked up by the Portland Press Herald, and provided a tasty backdrop for many food-related programs that we hosted during Maine Restaurant Week. 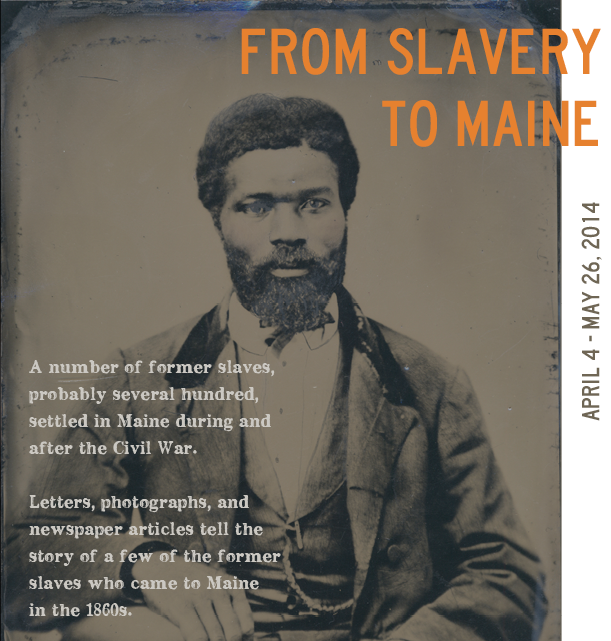 From Slavery to Maine (April 4 – May 26) was curated by Candace Kanes, Historian and Maine Memory Network Curator. A number of former slaves, probably several hundred, settled in Maine during and after the Civil War. Some came through the auspices of Gen. Oliver Otis Howard, a native of Leeds and head of the Freedman’s Bureau; some with individual soldiers, and others on their own. Letters, photographs, and newspaper articles tell the story of a few of the former slaves who came to Maine in the 1860s. 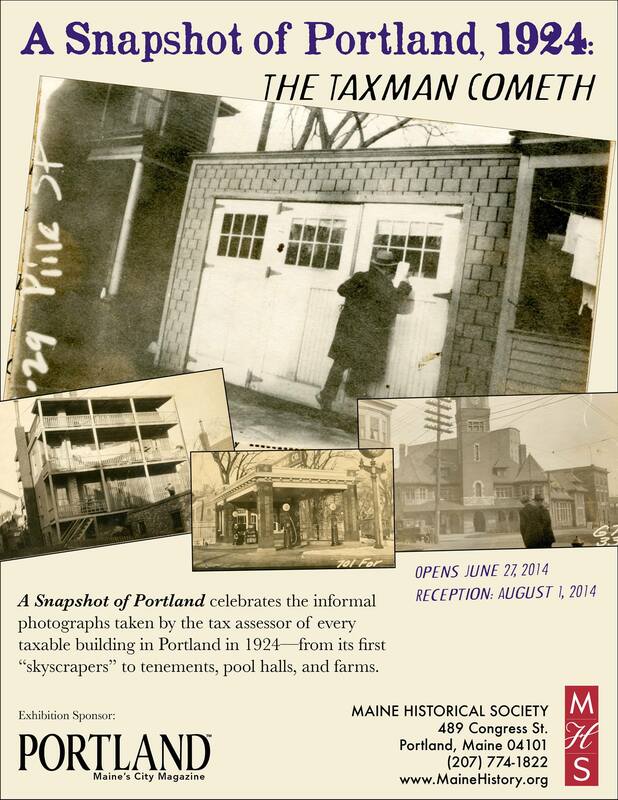 A Snapshot of Portland, 1924: The Taxman Cometh (June 27 – September 28) celebrates the informal photographs taken by the tax assessors of every taxable building and home in Portland (including the Casco Bay islands) in 1924. These unique images were recently added to the Maine Memory Network, making them easily accessible to the public. The exhibition highlights a selection of these fascinating snapshots of Portland life-from its first “skyscrapers” to tenements, pool halls, and farms. The visual and descriptive record created by men and women hired by the Tax Assessors Office provides a unique view into Portland’s architecture, neighborhoods, industries, and businesses at a time when Portland was on the verge of profound changes. If you missed the show in person, you can view Barry’s selections in this online exhibit. Wholesome Habitations: Architectural Collections at Maine Historical Society (October 3 – present) was curated by Jamie Rice, Director of Library Services with collaboration from Ted Oldham, MHS Trustee and Joseph Reynolds. This exhibition, sponsored by SMRT Architects and Scott Simons Architects, highlights the extensive architectural drawing collection at the MHS. On display are various forms of architectural drawings and supplemental items, such as presentation drawings, elevations, floor plans, decorative elements, and photographs. 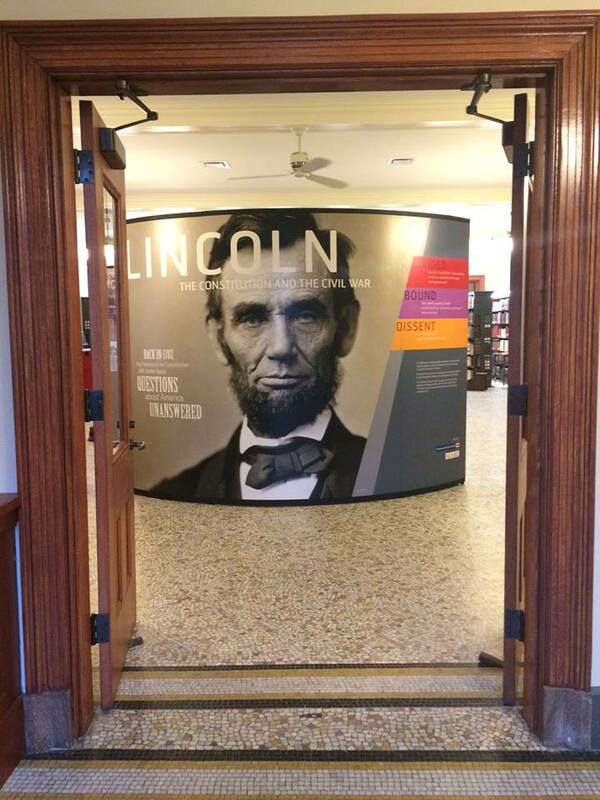 The nationally traveling exhibition, Lincoln: The Constitution and The Civil War, from the American Library Association and National Constitution Center arrived at the Brown Library on November 12. This extraordinary show came to us as a collaboration with the Maine Irish Heritage Center. It highlights emancipation and President Abraham Lincoln’s struggle with the constitutionality of the thirteenth amendment. The exhibition marks the first for our new repurposed space in the Reading Room of the Library, was highly attended, and included three evening events – bringing in nearly 500 people to the Brown Library. This show closed on December 20. Our Registrar & Collections Manager, Holly Hurd-Forsyth, curated the special mini-exhibition Affectionately Yours, Charles Dickens. This compact but awe-inspiring display was located in the Wadsworth-Longfellow House during the holiday season and was available for guests to view during tours in November and December. Affectionately Yours featured, among other items, an original letter from Charles Dickens written to Senator Charles Sumner in 1842. As part of our spectacular fundraising event in May, An Evening in the 1920s, we displayed a mini-exhibition for one night only in the historic Portland Masonic Temple. Guests enjoyed seeing MHS collections from the 1920s, relating to themes of fashion, photography, and prohibition. Monument Square–once known as Market Square–is the beating heart of Portland’s downtown, a landmark space that holds our city’s history, culture, and community. In April, we collaborated with the proprietors of the Public Market House, to present MHS collection images relating to the history of Portland’s Monument Square in their space. 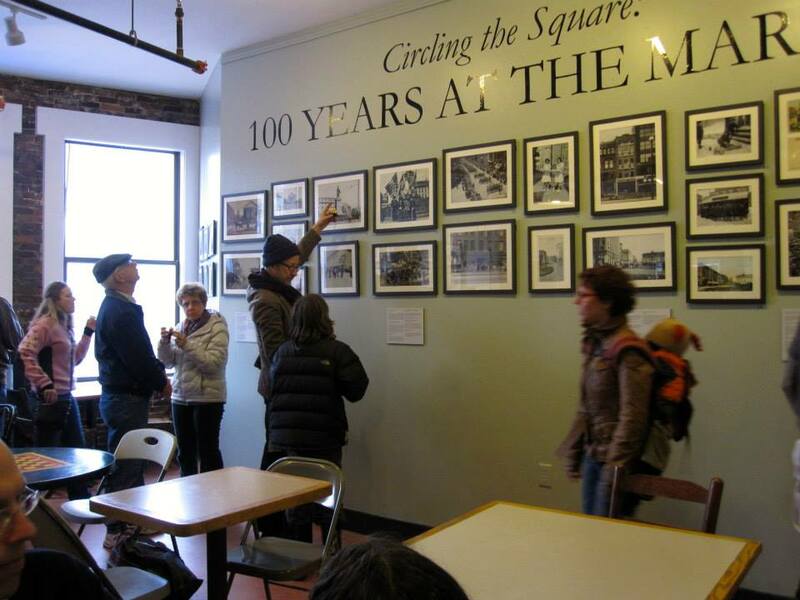 Circling the Square: 100 Years at the Market opened on April 4 during the First Friday Art Walk, and remains on permanent display on the venue’s second floor. A trip to Maine Historical Society isn’t complete without a walk across the street to see the monument, this photography show, and have a tasty lunch by the local food merchants in the Market! Our education programs this year focused on increasing and diversifying our audiences and we have succeeded in a number of areas. This is due, in part, to the wonderful addition of Kathleen Nuemann, who joined our team in February as Manager of School and Interpretive Programs. She has reinvigorated our programs by creating new and engaging curricula and fresh narratives for the Wadsworth-Longfellow House. Kathleen piloted the family-friendly, kid-approved “Children’s Hour” for young children and their caregivers. This story time and craft-making program was tied to seasonal themes around Thanksgiving and Christmas. The program drew a number of people, of all ages, who have never visited MHS before to our campus. Be on the lookout for more Children’s Hour programs in 2015! The education team experienced one of our busiest spring seasons yet with school visits: only two weekdays in May were without school groups – one of which was Memorial Day! This summer, we held our second week-long Junior Docent Camp, where seven campers came to learn about Maine history, Longfellow, and at the week’s end, they hosted a highly-attended and well-received open house at the Wadsworth-Longfellow House for their friends, family, and the MHS staff. Because of the camp’s success, we are planning for another session in 2015, with the possibility of adding a second session. Local History Local Schools, a program started in 2005 for elementary students from southern Maine, returned after being on hiatus last year. The program is based on our current major exhibition, involves in-classroom visits from MHS educators as well as a trip to the museum, research and art-making, and a family celebration displaying student work in the gallery at the project’s culmination. In honor of this program, MHS recently dedicated a new student gallery space for displaying and celebrating students’ history projects. This year, students from Hall Elementary in Portland presented their work – including Wadsworth-Longfellow House models, dioramas, and hand-drawn postcards – based on our current exhibition, Home: The Longfellow House and Emergence of Portland. The event was celebrated among students, their family, friends, educators, local community, and the MHS Education Department in December. Twenty-five classrooms from five Portland-area schools have signed up to participate during the 2014-2015 academic year. In concert with the Digital Engagement department, we worked to further incorporate the Maine Memory Network (MMN), a digital museum of images, online exhibits, and other Maine history related items from over 270 contributing partners around the state, into all our education programs. Through MMN and the MHS website, we are helping students and educators discover Maine history in a new way with online lesson plans, tool kits and in-depth research. For the second year, we hosted Student Spotlight talks that showcased new research from undergraduates and graduate students at Maine colleges and universities. During one session with recent Bowdoin College graduate Wallace Scot McFarlane, we facilitated a discussion about the pollution and clean up of the Androscoggin River in a partner-talk with the Maine Audubon (listen to the podcast). MHS is part of an association group that took responsibility for restructuring and hosting Maine National History Day, an annual event for teachers and students grades 6-12 that promotes critical thinking skills through project-based learning. The University of Maine hosted the competition for the first time with great success and strong participation. MHS and the Maine Humanities Council collaborated on recruiting judges and co-facilitated the judge orientation at the contest. For the first time in years, a Maine student won a first place prize at the national competition in Washington, D.C.: Noble High School student Noah Binette (pictured left) won top place for his presentation, Malaga Island: The Community that Maine Erased. Noah’s exhibit is now on display at Smithsonian National Museum of American History and has been chosen for display in New York at the annual conference of the American Historical Association. Our Digital Engagement department reports that 2014 has been an exciting and productive year for its staff–digitizing new items, visiting communities throughout Maine, and providing online access to historical material for people across the world through the Maine Memory Network (MMN). 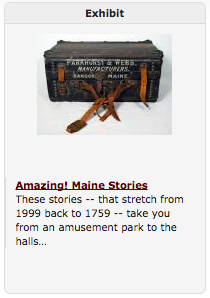 MMN is an online museum that makes thousands of Maine-related historical items and online exhibits from our Contributing Partners–museums, archives, libraries, and historical societies–available to online viewers. In 2014, MMN received approximately 1,783,500 page views with more than 262,000 visitors. More than 1,000 items were posted online to Maine Memory by several of our approximately 270 contributing partner organizations. At the close of this year, MMN has 44,816 historical items online, 200 online exhibits, and 276 contributing partner sites. Some popular online exhibits include Amazing! Maine Stories, Twenty Nationalities, But All Americans, Auto Racing in Maine: 1911, Cape Elizabeth Shipwrecks, Longfellow: The Man Who Invented America, and Working Women of the Old Port. #7572 Medical Recipe from the late 1700s. #27949 Alameda Roller Polo Players, Bath, ca. 1895. Contributed by Patten Free Library. #1203 Teams of Horses Scrape Ice off the Kennebec River near Bowdoinham, ca. 1895. Contributed by Maine Historical Society. #29224 Deborah Morton Pours Tea for Westbrook Seminary Faculty, ca. 1896. Contributed by Abplanalp Library, University of New England. #4171 Map of the Great Fire of Portland, 1866. 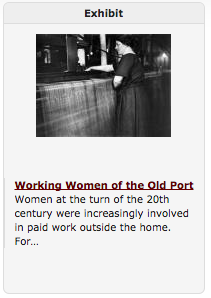 Contributed by Maine Historical Society. #23426 H.H. Hay Building, Portland, ca. 1890. Contributed by Maine Historical Society. #31153 Hallowell-Chelsea Cribwork Bridge, Chelsea, ca. 1860. Contributed by Hubbard Free Library. #19228 The M. V. Bluenose Ferry, Bar Harbor, ca. 1960. Contributed by Jesup Memorial Library, photography © Willis H. Ballard Estate. One of the most used collections on Maine Memory Network is the 1924 Portland Tax Records with more than 20,000 images and building information of taxable properties from 1924. In January 2014 we announced that the 1924 Portland Tax Record Digitization project was finally complete after four and a half years of work–organizing, scanning, and cataloging the records and images for all the taxable properties in Portland (and the Casco Bay islands) in 1924. We now have more than 20,000 records online, which are searchable and images are available for purchase. The Portland Press Herald wrote this article about the success of the project through the collaborative efforts between MHS, the City of Portland, and the Portland Public Library. In partnership with Maine Humanities Council, we awarded the second set of Local and Legendary: Maine in the Civil War grants, funded by the National Endowment for the Humanities, to Bethel, Livermore-Livermore Falls-Jay, Pittsfield, Rumford, and Scarborough. This year and next, community teams explore connections between Maine’s Civil War story and national themes and experiences. The Digital Engagement department provided training and support to these communities as they digitized their collections and uploaded items to Maine Memory Network. Keep up with all the teams and their progress on our (Re)Living History blog, dedicated to Maine Memory Network and educational outreach. One of our new Contributing Partners to Maine Memory Network in 2014 was the Tate House Museum. Longtime MHS friend (and sometimes exhibit curator) Laura Fecych Sprague, who is the consulting curator at the Tate House, spearheaded the effort to get some of the Tate House’s collections on MMN. Elizabeth Hopkins, a student at Skidmore College and a summer intern at the Tate House, learned how to scan, photograph, upload, and catalog items for MMN. She uploaded 20 items, including letters and documents that she or others transcribed. She did research in the Tate House collections and, along with Laura Sprague and Tate House Museum Assistant Grace Batsford, wrote the online exhibit, The Life and Legacy of the George Tate Family. Other new Contributing Partners include the Lithgow Library in Augusta and the Whitefield Historical Society. Candace Kanes, our MMN Curator, has been working with Sheila McDonald, Deputy Director of the Maine State Museum, to carry out a longtime interest of the two organizations: make at least part of the John Martin Collection – co-owned by MHS and MSM – available online. John Martin (1823-1904), a native of Ellsworth who lived primarily in Hampden and Bangor, called himself “expert accountant.” However, Martin was much more. Starting around 1864, Martin wrote accounts of his life and times so that his children would know more about him and about the community in which they grew up. His commentaries on agriculture and gardening, architecture, politics, business, church, schools, transportation, singing and dancing, and family life offer fascinating details about the era and the Penobscot River region. In addition, Martin illustrated his Journal and the three scrapbooks that are part of the collection. The Maine State Museum wrote a grant proposal that was funded by the Delmas Foundation to digitize the Journal and scrapbooks, to prepare transcriptions, and to put at least some of it on Maine Memory Network. The 650-page journal will be the first to go online, early in 2015! VintageMaineImages.com (VMI) is an online source for purchasing reproductions of more than 26,000 historical images (all of which are on Maine Memory Network). VMI sells archival photographic print reproductions, as well as high-resolution digital files and creative use fees. When we sell an image that was uploaded to our site by a Contributing Partner, we send them a check for 50% of the sale, so the money goes back into historical preservation projects in communities throughout Maine. In 2014, VMI sold a total of 584 images, 332 of which were uploaded by 44 Contributing Partners. The 1924 Portland Tax Record images proved to be the most popular type of sale with 173 images! 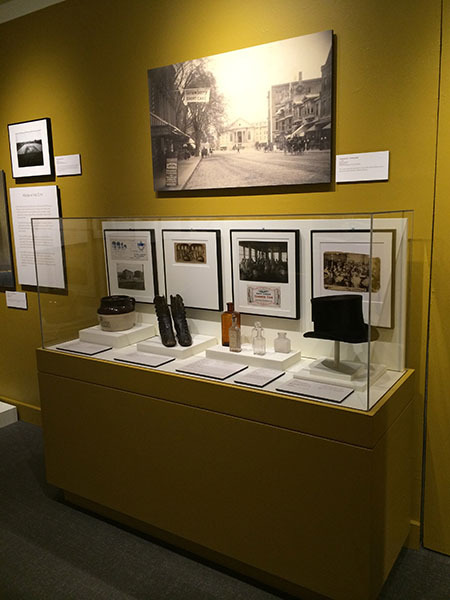 Throughout 2014, images from our collections–as well as the collections of our Maine Memory Network’s Contributing Partners–were used in many interesting projects including exhibitions, books, television, and film. Our Image Services Department manages the rights and reproductions of collection material, and works with authors and organizations to provide the images needed. Images were also used in several interpretive panels this year including one at the 150th Year Celebration of Prince Edward Island sponsored by the Mi’kmaq Confederacy, one at Fort Preble on the campus of SMCC in South Portland, and another that was part of a series of panels at the Church of St Michael and All Angels in Princeton, (United Kingdom) which told the story of the American prisoners of war who built the church in the 19th Century. In August, we welcomed Tilly Laskey to the Maine Memory team as our Content Assistant. Tilly assists us in all aspects of running the website including outreach, training, and research. This picture shows Tilly (right) with Kathy Amoroso, Director of Digital Engagement, at the Maine State Library for a Maine Archives & Museums conference.